I’ve been back from Tucson since Saturday, and the good life of being a guest in someone else’s home is over. Luckily, I haven’t been expected to cook here either. Our good friends from New York were already in Miami, waiting for Averi and I to get here. Which meant brunch at their favorite place on Sunday, followed by the day at the beach and then dinner at a local Indian restaurant. Since they are from New York they were convinced that there is no good Indian here. They now know they were wrong. 🙂 We also enjoyed some great Cuban the next night and a casual pizza the third night. Hence the no cooking. Michael also lost weight while I was gone – 6 pounds to be exact. 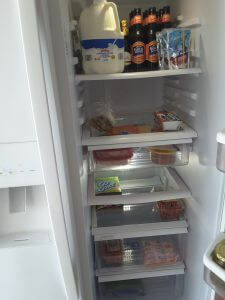 If you follow me on Facebook (as I continually say you should) you won’t be surprised by this, as you saw the pic I posted of his version of a stocked fridge. How can you snack with a fridge like that? But I am back with him now. And back to condo living. Which means that people come into my unit to work on things and I have no control over it. Before I left, the building had started a project where they were replacing all the glass black decorative “windows” with just regular glass. Anyways, yesterday I got a call letting me know that today they would need to come inside and finish framing the glass. It would take an hour and I needed to be there. No problem, I can give an hour. Except they don’t know when that hour will be, so I need to just sit around the condo till they show up. Now, I do have Amazon Prime and Netflix, so I can kill a morning just fine. But this six pound weight loss of Michaels does not work for me. He obviously NEEDS some good home cooking. And as I’ve mentioned before, I like to have something baking when people come into the condo cause it makes the place smell good, which covers up mess. And just as delicious. The ricotta cheese gave a rich taste to it, but the whipped cream cheese kept it light. 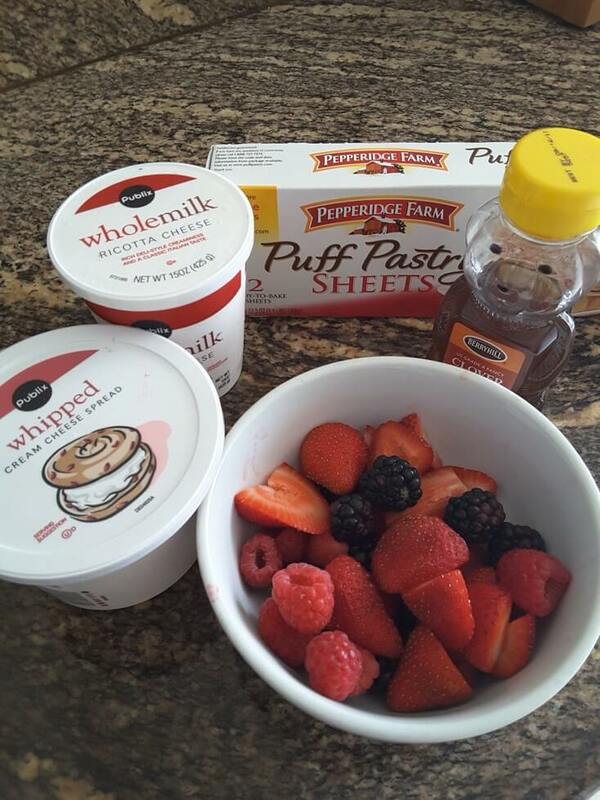 The berries are fresh, the honey is sweet. And the salted caramel is salted caramel. As I type this I am now thinking a drizzle of chocolate syrup would be fantastic as well. Next slice! In a small bowl mix the ricotta cheese, cream cheese, honey and vanilla. If not sweet enough, add more honey. 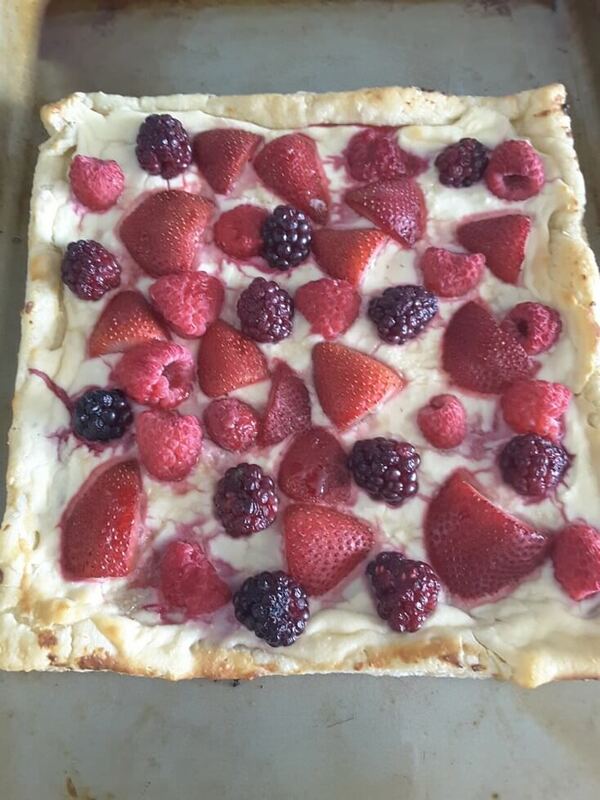 Place pastry on a greased baking sheet. Make sure all seams are sealed and and fold up the sides to create a little wall to hold the filling in. Spread ricotta mixture over the puff pastry, covering completely. Cover ricotta mixture with the berries. 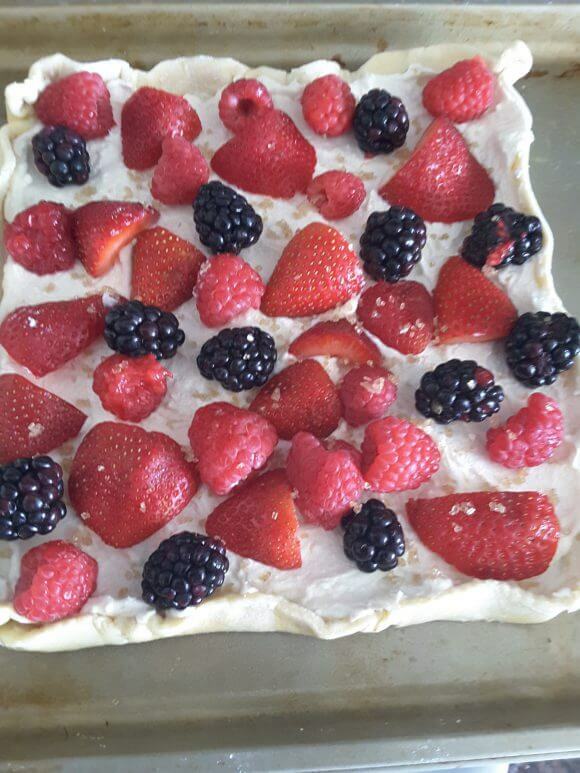 Sprinkle the sugar over the top of the berries and the pastry. Serve as is or with a drizzle of chocolate syrup or honey. *I know I am all about swapping out ingredients but I highly recommend keeping with the whipped cream cheese. It provides the lighter smoother texture you will want for this recipe. If you do use regular cream cheese, though, make sure to let it completely soften and then beat in kitchen aid with the ricotta.